The Brittany is a medium-sized bird dog that originated in France in the 17th Century. They were an all-purpose game dog in Europe, and were expected to hunt, point and then retrieve game – everything from feathered prey to furred game such as rabbits. Once known as the only pointing spaniel, the term ‘spaniel’ was dropped from its name in 1982 because of such conspicuous differences in hunting styles; Brittanys point, while spaniels such as the cocker and English springer flush game. 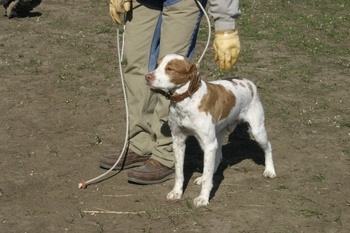 Topping out at 20-1/2 inches and 50 pounds, the Brittany comes in several coat colors – orange and white or liver and white in either clear or roan patterns. The coat is a single coat, as opposed to a double coat like spaniels or retrievers (dense, insulating undercoat and weather-resistant outer coat), which makes it easy to maintain, and it’s usually dense and either flat or wavy. The tail of the Britt is short; if puppies are born with a long tail, it’s usually docked to the appropriate length – especially if it’s meant to work in the field. Brittanys are an energetic, athletic dog that are rockets in the field – they’ll work tirelessly in pursuit of birds and possess a sweet, biddable nature. They’re eager to please and tend to be softer than many bird dogs – heavy-handed corrections are rarely needed and usually aren’t beneficial to training. In addition to great upland-bird hunters, Britts are great family dogs – they’re not too large so do well in the suburbs (provided they’re given exercise and stimulation) and get along well with children. The Brittany typically ranks around the 30th most-popular dog according to AKC statistics [https://www.akc.org/reg/dogreg_stats.cfm], and unlike most breeds that finds popularity, the breed hasn’t suffered from a huge between the conformation ring and the working field. Brittanys have more dual champions (those possessing champion titles in both the field and show ring) than any other breed in the AKC. Fairly healthy dogs, Brittanys enjoy a lifespan of 12 to 15 years of age on average. They suffer from hip dysplasia, so be sure to buy puppies from breeding stock that has undergone evaluation. Additionally, at Paw Print Genetics, we test Brittanys for the immune system disorder known as complement 3 deficiency. By testing potential mating pairs for the disease, breeders can avoid producing puppies that will be affected.